First of all, the DriverFinder team thanks you for taking the time to read more about our product. What sets DriverFinder apart is that it does exactly ‘what it says on the box’. It‘s a driver scanning, comparing and updating utility for Windows-based PCs. We do not create the drivers themselves. In fact, you can obtain drivers freely from device manufacturers on their respective websites. The premium service DriverFinder provides is to simplify the identification, matching, downloading, and installation of drivers for your PC. Allow us to put it this way… what devices do you have connected to your PC now? Probably your display monitor, keyboard, mouse, speakers, webcam, printer, scanner, USB device, mobile phone, digital camera, Bluetooth device… we‘ll stop right there for now. These devices all need drivers to communicate with your PC and here’s the thing: hardware manufacturers release new drivers all the time! They do this to fix bugs discovered based on user feedback on their products, when they want to release new features, and when they want to make sure their products still work even when you upgrade your operating system (OS). At any given time, your PC may have over a hundred drivers installed and to keep track of which ones need to be updated to their latest versions - and hopefully BEFORE they cause problems for your system - well, that can be a nightmare. Let’s go through a typical PC problem that requires a new driver (an audio driver in this case). You start your PC and all of a sudden no sound is coming out of your speakers. You most likely need a new audio driver. So to get it you need to check your PC brand and model number, check your Windows operating system version, check your audio device brand and model, check your sound card. Next, you need to go to the audio device manufacturer website and try to locate the audio driver that matches all of the above criteria. At this point, there are three main challenges to overcome. Most hardware device manufacturer sites are not very user-friendly so it can be hard, time-consuming and downright frustrating to find the right matching driver for your PC. Lastly, what if you accidentally downloaded and installed the wrong driver? At the very least, you will continue to experience no audio. At its worst, the wrong driver may case device failure, Windows error codes, bluescreens or system crashes. Bottom-line: DriverFinder saves you the time, risk and hassle often associated with ensuring your device drivers are up-to-date. Now that you know what DriverFinder is all about, please allow us to explain what we are NOT. DriverFinder does not ask for payment for drivers downloaded. DriverFinder does not charge anything for any driver downloads. What you are extending is a one-time payment for the service of immediately identifying, matching, downloading, and installing the latest drivers for your PC. DriverFinder does not apply scare tactics. Unlike competitors, we do not inexplicably show Windows-like messages scaring/tricking you to update drivers… or else. You do a driver scan; we show new drivers available for your system; and it’s up to you if you want to avail yourself of these driver updates. Period. DriverFinder does not inflate driver scan results. What you see is what you get from DriverFinder. We will NEVER indicate a driver as needing updating if it does not. We’ll just be completely upfront here… the accuracy of our product and the service it provides is not only out of commitment to you. It saves us a lot of time and headaches too! 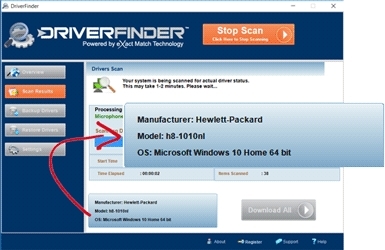 You can quickly see our commitment to accuracy because as you conduct a driver scan using DriverFinder, we will immediately show your PC brand, model and the version of Windows® you have installed, indicating that we have correctly identified your system. This assures you that driver recommendations will be matching your PC accurately. We want to let you know that as you sleep, our unique combination of (1) automated crawlers, (2) electronic driver file analyzers, and (3) computer professionals are busy verifying driver files from all over the globe and adding them to our database for your use. However, that’s ‘behind the scenes’ so allow us to mention these instead. One of the ways we show our commitment to honesty is the simple fact that we do not hide who we are and that we take steps to ensure that our site and product are safe and secure for your use. Thank you for reading this. 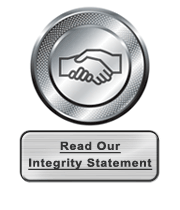 We may call it our Integrity Statement to our readers and clients but really… this is just the way we do business.